Can you imagine the world when ice cream was just starting to become popular? Picture life before you could order pie à la mode, before Ben met Jerry, before ice cream had its own trucks and melodies, before states legalized rainbow sprinkles. It was a simpler time. Jacques Twistee had finalized his life-changing invention, which was originally intended to be an edible glue. Slowly, you would start to hear about this utterly delicious, milky, sugary, creamy confection. All your friends would ask, "Have you tried ice cream yet? It's the best thing since sliced bread (another new invention at the time)." Your butcher, Emmanuel, would say, "Have you tasted one of those ice cream sundaes? There's a banana now so it's probably pretty healthy." Maxwell the blacksmith would tell you, "That ice cream is perfection. You can have it in a cup or a sugary wafer that you can eat, too! " Joaquin, the town crier, would bellow, "I scream! You scream! We all scream for ice cream!" followed by hysterical high-pitched shrieks. Even though you hadn't even sampled ice cream yet, you already hated it. You were sick of hearing about how awesome it tasted and how refreshing it was on a sweltering summer afternoon. But then, like the principled American politician you are, you caved. You decided to give it a shot. One or two licks just to prove to yourself that it was unimpressive. And then you realized, ice cream lived up to its hype. Austin is pretty much exactly like ice cream in this regard (also, that it's really sticky). Spencer and I have heard so many wonderful reasons about why Austin is so cool, so hip and such a fun city. We figured there was no way that Austin could live up to the hype, but spoiler alert: It's one of our favorite spots yet. We started our visit to this eclectic city by shopping and eating along South Congress Avenue. Known as SoCo to people that feel cool abbreviating normal words, this street is lined with a range of businesses, from a country western wear emporium, to trendy boutiques, to tasty Mexican taquerias, to pizza parlors to quirky food trucks converted from trailers. If anything could be made for me, it's this cupcake Airstream trailer. All the stores on South Congress are colorful and intriguing -- begging you to come inside and buy delightful goods! This TOMS store sells shoes AND coffee! What more do you need? We indulged in lots of tasty treats while we strolled around the area, but our favorite spot was brunch at South Congress Cafe, which is known for their delectable Bloody Marys. After all that walking and eating, we were hungry again. We popped over to the Whole Foods flagship store, which is unlike any grocery store (or Whole Foods) in the country. At more than 80,000 square feet, this Whole Foods is downright overwhelming. From its wine bar and barbecue restaurant, to its craft beer selection and custom chocolate displays, this isn't your average supermarket. Before the night was over, we tried to experience another weird, quintessential Austin activity: Watching the Congress Avenue Bridge bats. Home to the world's largest urban bat colony, up to 1.5 million bats emerge from underneath the bridge to feast on insects during the summer. Spencer and I arrived early to stake out a prime spot to view their descent upon the city before dusk. Unfortunately, the best laid schemes of mice and men often go awry. The same must be true for bats, too. We waited, and waited, and saw a few bats fly away, but nothing like the mass exodus we were promised. Bats > tourists. For our next adventure, we opted for something less dependent on the season, the sunset and furry, little critters who like eluding visitors. We embarked on the Texas State Capitol, a National Historic Landmark and a beautiful example of 19th century architecture. While the grounds and the outside of the Capitol are quite remarkable, the inside has some impressive features, too. Saving taxpayer money on new furniture, the walnut desks were originally purchased in 1888. However, bowing down to technology, the inkwells have been replaced with microphones. These brass chandeliers are also original to the building, spelling out TEXAS in the Lone Star design. You can find the Lone Star on all things Texas, including on these gorgeous studded chairs. While Austin by day is certainly entertaining, Austin by night is twice as fun. 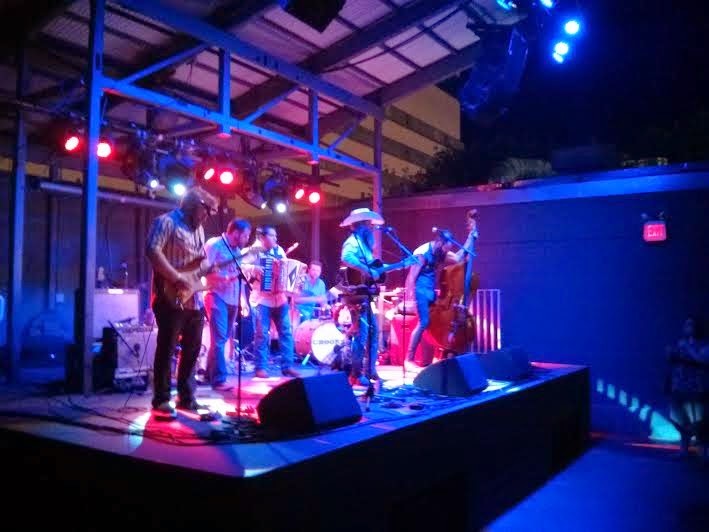 Known as the "Live Music Capital of the World," Austin boasts a serious daily offering of live bands and musicians. 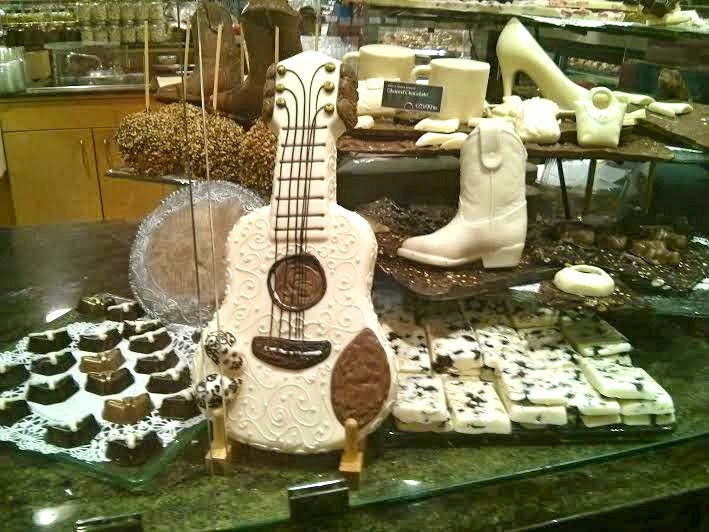 Not just country, folk or bluegrass music, Austin has a flavor for everyone. Spencer and I ventured out to meet a friend to enjoy some local bands near Sixth Street, where your mood can designate which of the dozens of bars or clubs you hop to next. 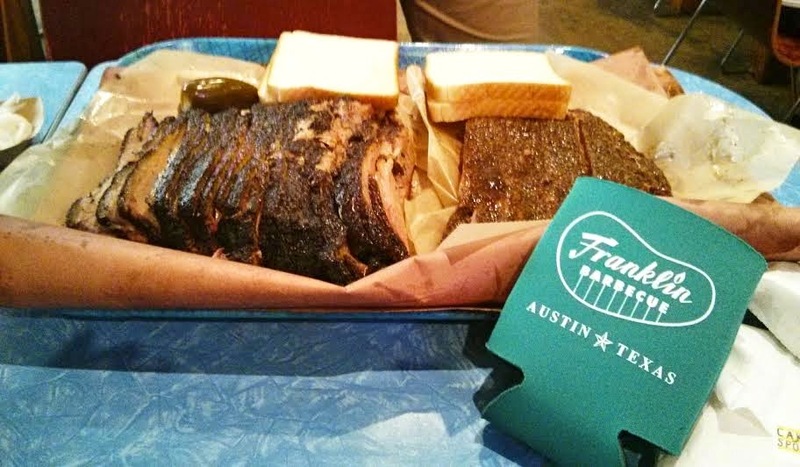 If you stay out too late and you crave some barbecue for your hangover, we would suggest a lengthy five-hour wait at Franklin Barbecue. 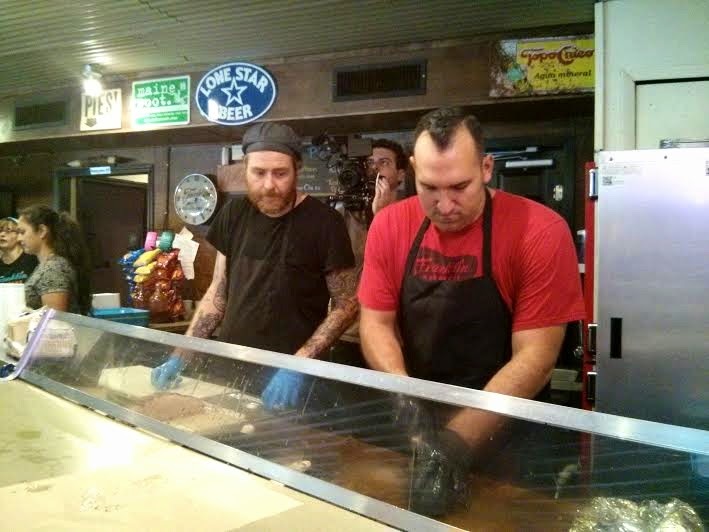 Consistently rated one of the top barbecue restaurants in the country, Franklin is just as popular as it is delicious, perhaps even more so. So despite Rachel being a vegetarian, we felt like waiting for Franklin was some type of meat mecca that we shouldn't leave Austin without attempting once. The line was hundreds of people deep at 9:30 a.m. If you go to Franklin, come prepared with a patient attitude and something to occupy your time. We purchased folding chairs at the local drugstore and brought our laptops so we could work. (Warning: Most people will be amazed that you have a job and aren't in college.) We were assured that we would get some type of meat, but it would depend on what was left. Be prepared to eat while you wait to eat more. We grabbed some delicious breakfast burritos at a nearby Mexican restaurant during our stay in the Franklin parking lot. After five long hours (you can't really bail after 3 hours because you're committed by that point), we finally reached the glorious counter. Sitting down with your Franklin will make you feel like the most accomplished person ever. Move over, Malala Yousafzai. I'm ready for my Nobel Peace Prize in barbecue. Spencer had a few options available, since only some sides and the pulled pork were unavailable. He opted for the ribs and the brisket. 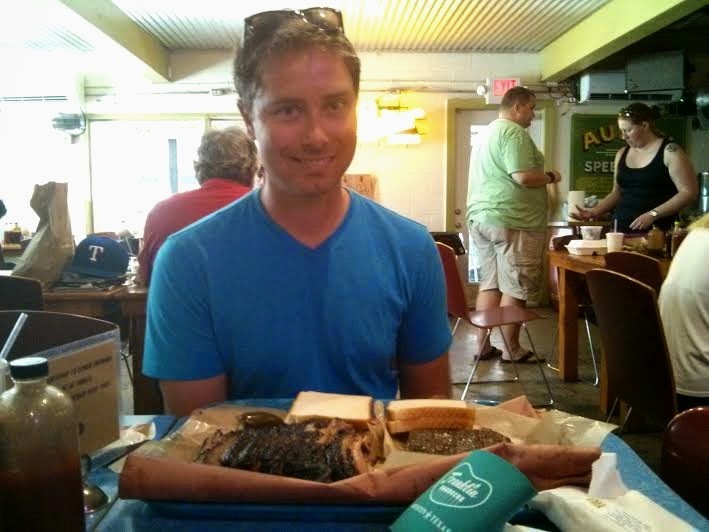 According to Spencer, the brisket was "the best I ever had." Would we wait five hours again? Unlikely, but the meat lived up to the hype. Oh, and don't worry about the vegetarian, I sampled some pies and earned that damn coozie. 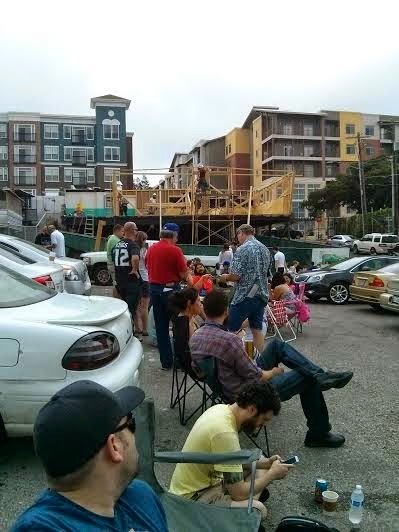 Even though we weren't able to see everything we imagined, Austin certainly beat the hype. We left the city with our bellies full, our ears happy and our bodies ready to tackle new adventures. We also left knowing that we would be back again. The writing's on the wall and the feeling is mutual, Austin.